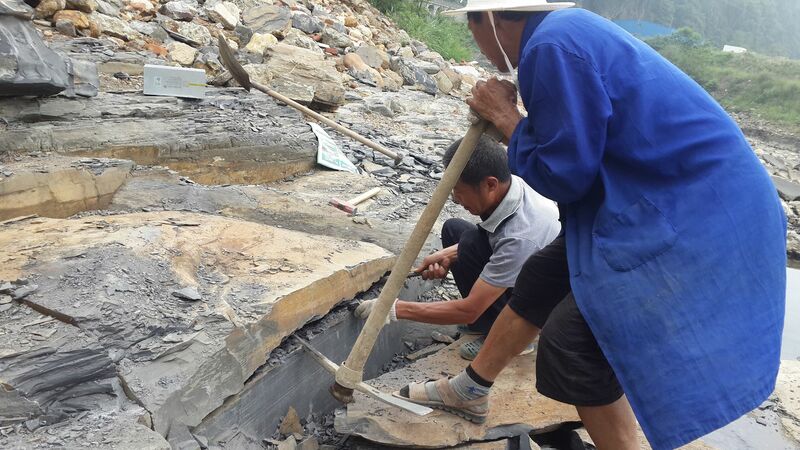 On the banks of the Danshui River in China, scientists have unearthed a treasure trove of pristine fossil remnants from one of the most important periods in the history of life on Earth: the Cambrian explosion. The big picture: The Cambrian explosion, which occurred a little more than 500 million years ago and lasted for about 40 million years, is the period when nearly all the major groups of multicellular life forms currently on Earth first appeared. It was a period of frenzied evolutionary development and biodiversity buildup, mainly in the world's oceans. Why it matters: Understanding the creatures that came into existence at that time will improve scientists' knowledge of where animals alive today fit into the planet's evolutionary history. What they found: The newly-analyzed Qingjiang fossil site in China has already yielded 4,351 specimens, and is expected to contain many more. So far, a large proportion of them — 53% — are new to science. "The authors of this study are going to have a huge job on their hands just describing these alone," Allison Daley of the University of Lusanne, who was not involved in the new research, tells Axios. The study, published Thursday in the journal Science, says it's possible the site contains more biodiversity than all other similar fossil sites from the Cambrian period. "It is a huge surprise to find a new deposit of such incredible richness and with such a large proportion of species that are completely new to science." Like other Cambrian fossil sites, the majority of creatures here are soft-bodied — like fossil cnidarians, including jellyfish and sea anemones, both of which exist close to the base of the animal family tree, according to Gaines. “These fossils are among the best fossils I’ve ever seen in my career," Daley says, noting that fossils at the Qingjiang site include soft tissues, eyes and internal organs. The bevy of new life forms that first showed up during the Cambrian explosion include creatures that are related to modern animals, but would be utterly unrecognizable if you came across them today. Scientists have been trying to put each creature in its proper evolutionary context, and the new findings may help. The site appears to have been located in an area that had environmental conditions that differ from some of the other Cambrian fossil deposit sites. According to Gaines, the Qingjiang site shows that differences among fossil assemblages can be caused by environmental conditions that influence ecosystem structure. One cool thing: Many of the Cambrian creatures were truly bizarre-looking. Many had four or five eyes. Some, like the Hallucigenia, had a head that closely resembled its tail, and were characterized by spikes sticking out from its back. Most invertebrates that emerged during this period were small — though there were some that went against this trend, like the Anomalocaris, or "abnormal shrimp," which measured 3 feet in length. The bottom line: Gaines says a central lesson from the Cambrian explosion is that it takes a rare combination of ingredients to produce a tremendous diversity of life forms, and that once it exists, such biodiversity should be preserved. "It also reminds us of our deep kinship to all living animals," he said. After about 3 billion years of Earth being dominated by microbes, complex, soft-bodied organisms (up to 3 feet long) emerged in the deep oceans. Combining evidence from the fossil record with insights from animal physiology, scientists have now put forward a new explanation for why this occurred about 570 million years ago, during a period known as the Ediacaran. What they did: The researchers studied a species of sea anemones that are similar in their breathing methods to creatures that live in the dark, oxygen-poor deep sea environment where complex organisms also emerged. By measuring how the sea anemone can cope with low levels of oxygen at different temperatures, the researchers from Stanford and Yale universities found the anemones have biological similarities to the deep sea organisms that emerged during the Ediacaran period. They report that both oxygen and temperature are important regulators of where organisms can flourish, and that the thermal optimum for anemones is relatively fickle. The lack of temperature fluctuations in the deep ocean may help explain why complex life first emerged there during the Ediacaran, the study finds. The big picture: The study suggests aquatic organisms may be quite vulnerable to acidifying and warming waters today, due to global climate change and other factors. Authors Tom Boag and Erik Sperling of Stanford told Axios the study's results make them more concerned about the oceans' fate in a warming world. Boag specifically warned that warming oceans with lowering amounts of oxygen, like we have today, have been associated with high levels of extinction in the past. Yes, but: This study puts forward a hypothesis about deep ocean evolution — namely the crucial roles played by oxygen and temperature fluctuations — that needs to be reproduced by additional research before its findings are accepted by the broader scientific community. New fossil evidence or data from physiological studies could go against their hypothesis, for example.